Discover the most charming apartments in Arlington Heights, Illinois at The Residences at Arlington Heights. Our community offers a variety of spacious, well-appointed floor plans that are sure to fit all of your apartment needs. Plus, if you are looking for pet friendly apartments in Arlington Heights, then look no further. We are actively accepting applications - call or visit us today! Our residents can also enjoy access to a playground and gazebo. At The Residences at Arlington Heights, there’s something for everyone! We offer the perfect location with I-90, I-290 and the Ned Brown Preserve located just minutes away from our community. At The Residences at Arlington Heights, residents are able to take advantage of our location by indulging in nearby shopping, dining, entertainment, and more! With spacious floorplans, exclusive amenities, and a convenient location, The Residences at Arlington Heights is the perfect way to start your next chapter. Give us a call at (847) 305-3341 with any questions, schedule a tour of a one, two or three bedroom apartment, and apply online today to find your perfect new home. 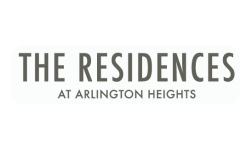 We look forward to helping you make The Residences at Arlington Heights your next home!